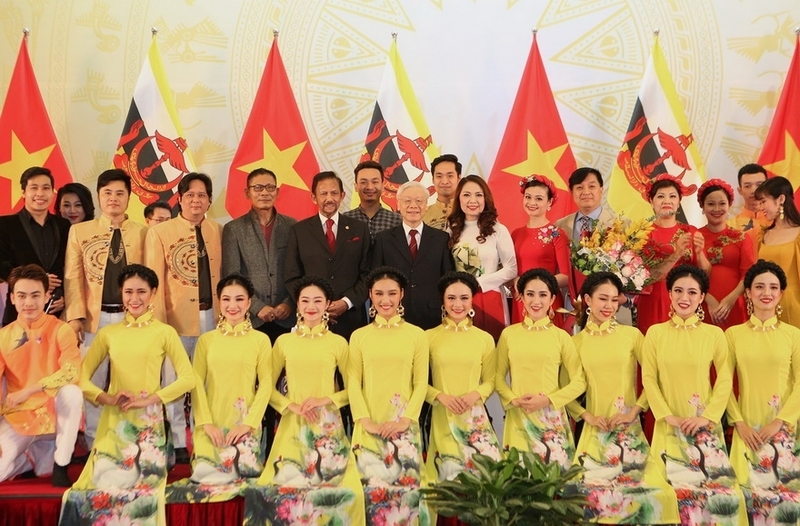 Vietnam and Brunei have established a comprehensive partnership during a three-day state visit to Vietnam of Brunei’s Sultan Haji Hassanal Bolkiah from March 26. 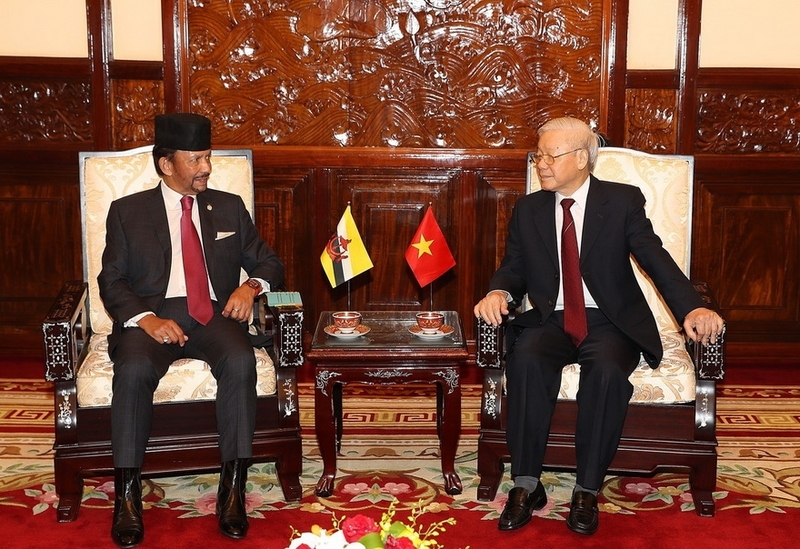 After a welcome ceremony at the President Palace on March 27, the Brunei leader had talks with his host Nguyen Phu Trong, and met with Prime Minister Nguyen Xuan Phuc. He also paid tribute to President Ho Chi Minh at the late leader’s mausoleum, and laid wreath at the Monument of Heroic Martyrs in Hanoi. 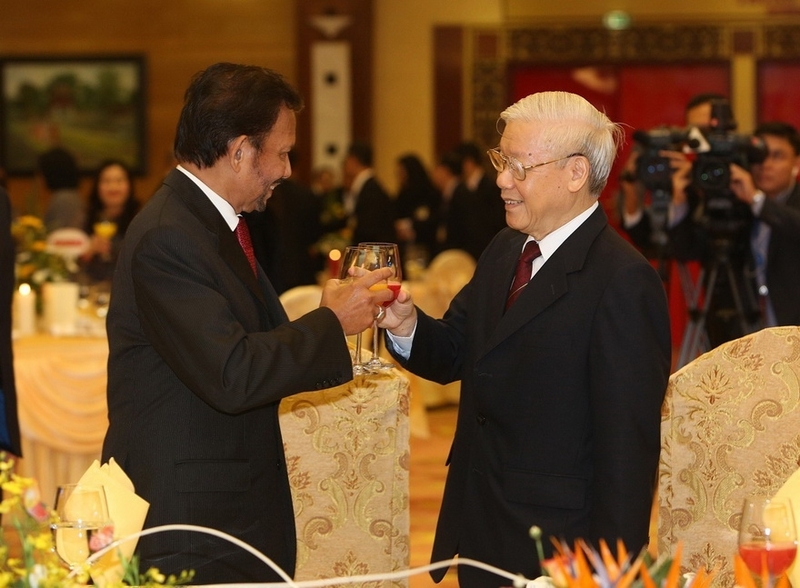 Party General Secretary and President Nguyen Phu Trong holds talks with Sultan Haji Hassanal Bolkiah. on the use of a hotline to deal with illegal, unreported, and unregulated (IUU) fishing between the two countries. 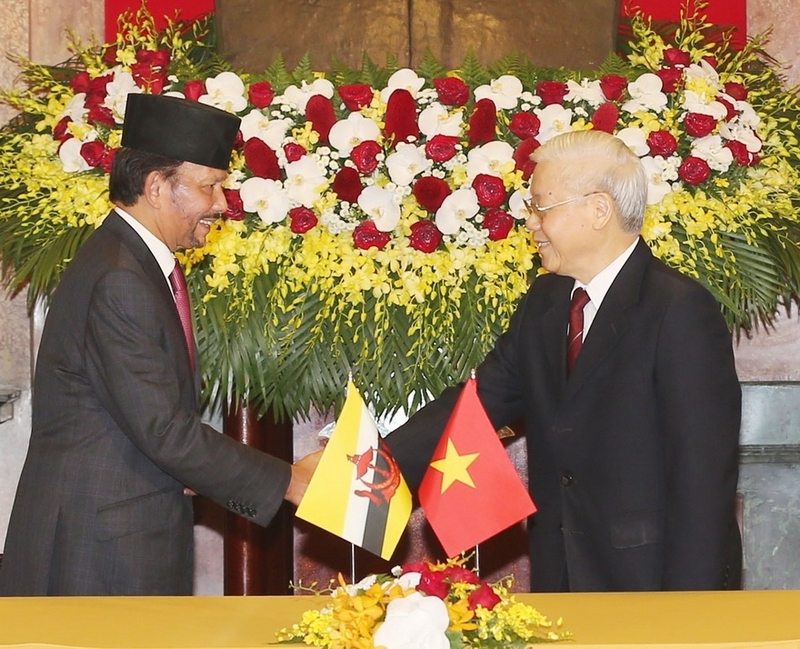 During the visit, a memorandum of understanding was signed on the use of hotline for information-exchange to address illegal, unreported and unregulated (IUU) fishing by the Minister of Agriculture and Rural Development of Vietnam and the Minister of Primary Resources and Tourism of Brunei. The two sides pledged to further expand aquaculture cooperation, share information regarding legal enforcement at sea, and cope with security challenges at sea in order to ensure maritime safety and freedom. 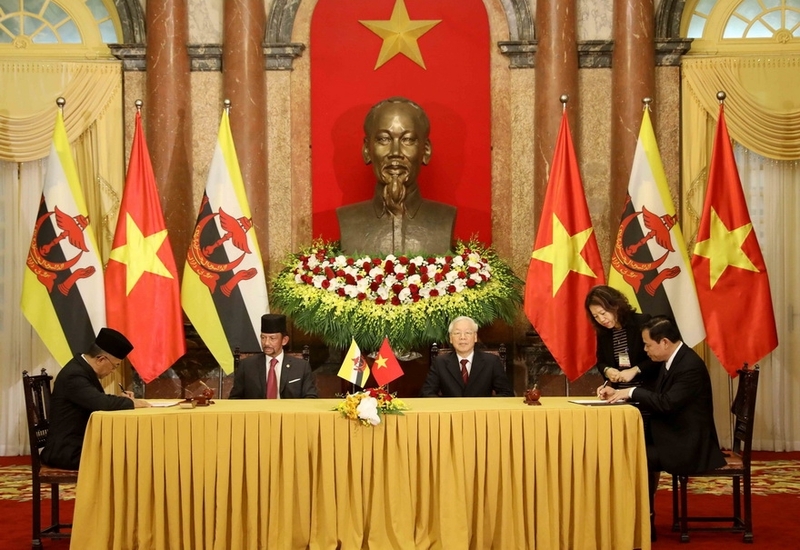 They concurred to step up cooperation to facilitate and promote bilateral trade in a more balanced and sustainable manner, towards the target of 500 million US dollars by 2025; optimize advantages in market access for each other’s goods and services on the foundation of free trade agreements, including markets in the East ASEAN Growth Area (BIMP-EAGA) and the Mekong sub-region; and create favorable conditions for businesses and promoting connectivity between business communities of both sides; and join trade fairs and deal with obstacles facing enterprises. 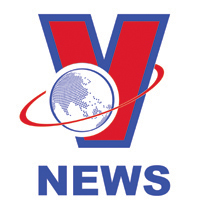 They committed to cooperating closely in particular in agricultural sectors, notably livestock and crops commodities, including poultry, rice, fresh fruits and vegetables, fisheries, technical capacity building, and halal manufacturing and certification for their enterprises of international standard operating in food production, cosmetics and pharmaceuticals that can be exported to the global Muslim markets. The leaders welcomed the cooperation between PTSC Mechanical and Construction Co., Ltd and PB Services Sdn Bhd following the signing of the Framework Agreement to establish a strategic collaboration between the sides in Engineering, Procurement, Construction, Installation, and Commissioning (EPCIC) projects in Brunei and regionally. 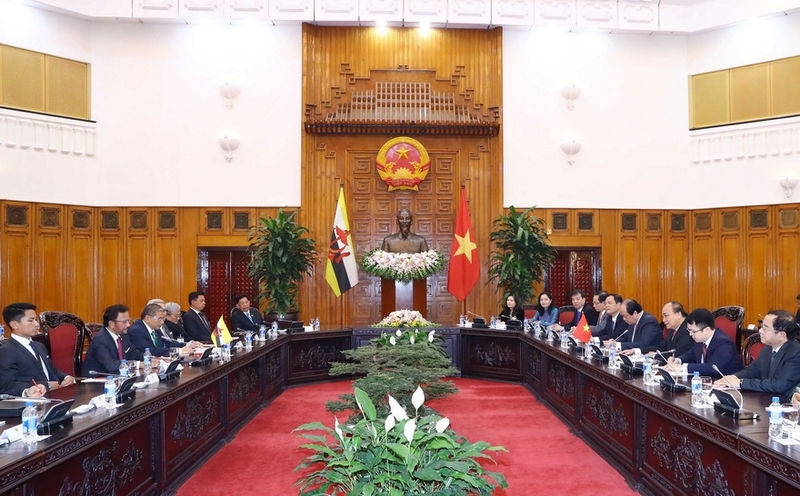 They expressed their delight over the sound cooperation at regional and international forums, such as the ASEAN and its mechanisms, Asia-Pacific Economic Cooperation (APEC), Asia-Europe Meeting (ASEM), and the United Nations (UN). 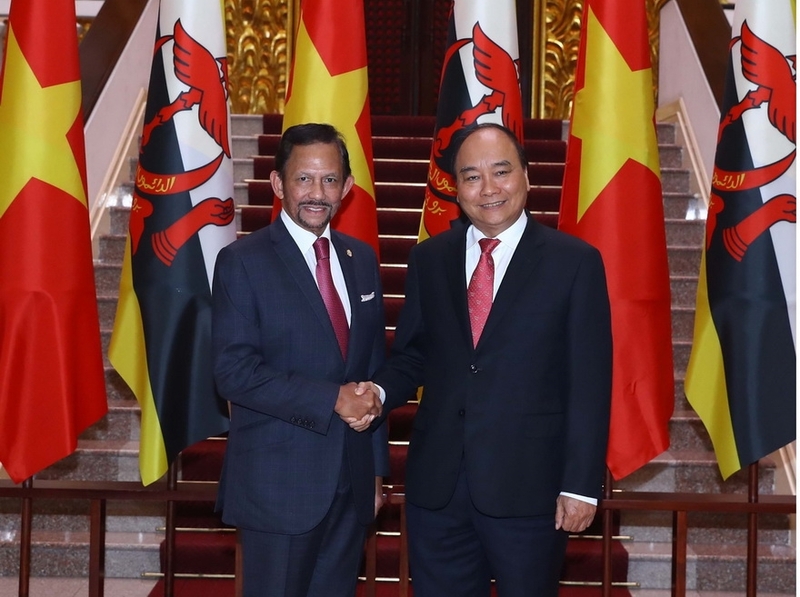 Vietnam thanked Brunei for endorsing the country to become a non-permanent member of the UN Security Council for the 2020-2021 tenure. Both leaders reaffirmed mutual support and close cooperation as the two countries are due to take on the rotary role of the ASEAN Chair in 2020 and 2021. 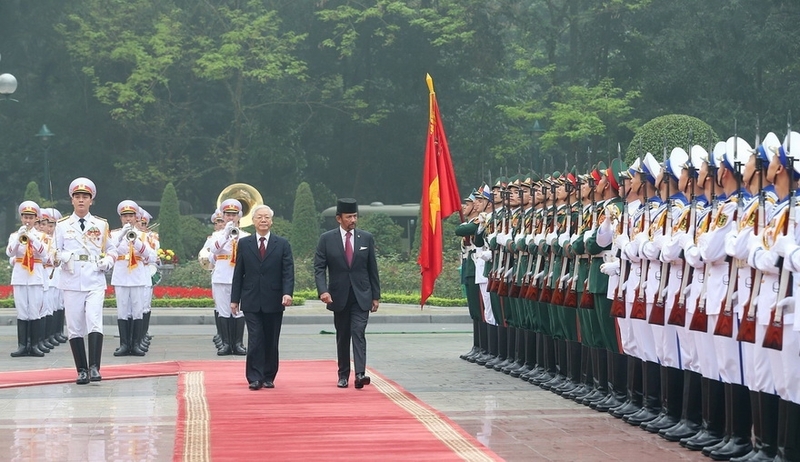 Prime Minister Nguyen Xuan Phuc has a meeting with Sultan Haji Hassanal Bolkiah. 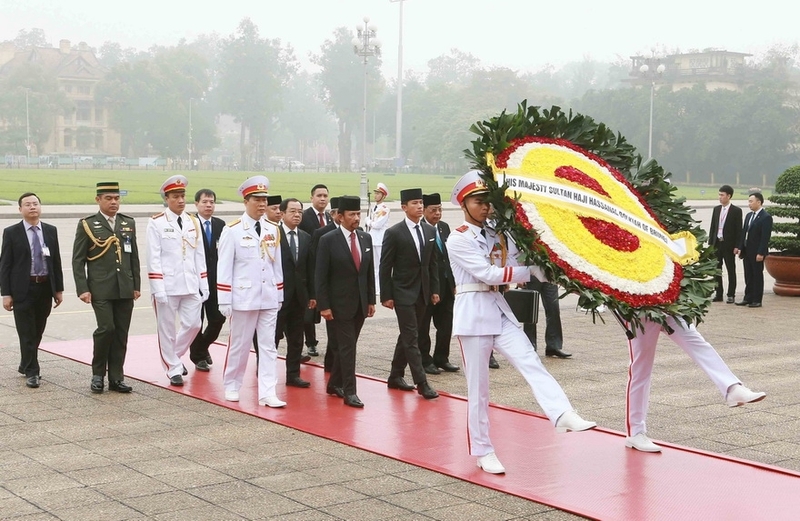 The Sultan of Brunei lays a wreath and pays tribute to late President Ho Chi Minh at his mausoleum. They underlined the importance of maintaining and strengthening solidarity, reaffirmed the importance of maintaining ASEAN centrality and unity in the process of building the ASEAN Community; committed to effectively realizing the ASEAN Community Vision 2025, stepping up linkage collaboration, narrowing the development gap, deepening external relations, and upholding ASEAN’s central role in the regional architecture in the principles of openness, transparency, and inclusiveness. The two sides reaffirmed the significance of maintaining and promoting peace, maritime and overflight security, safety and freedom in the East Sea, and stressed the need to strengthen mutual trust and settle disputes peacefully in line with international law, including the 1982 UN Convention on the Law of the Sea (1982 UNCLOS). 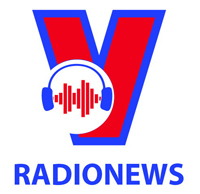 All the claimants and the other countries need to demilitarize and exercise self-restraint when conducting activities which could increase tensions in the East Sea, they stressed again. 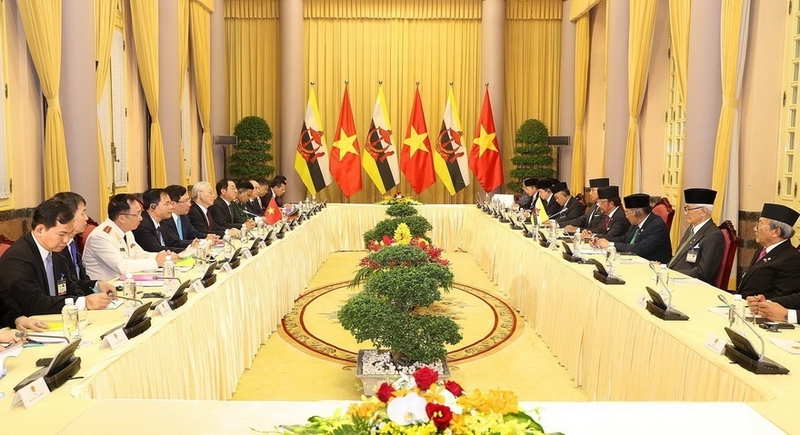 The two sides emphasized their support for the full and effective implementation of the Declaration on the Conduct of Parties in the East Sea (DOC), while welcoming advancements in ASEAN-China cooperation as well as in practical negotiations to finalize a code of conduct (COC) in the East Sea following the agreed roadmap.